ETFs tracking stock indexes figure prominently among the leading ETFs measured by assets under management and trading volume. Stock index ETFs allows investors to get exposure to the broader market with the same ease as buying a single stock. Stock index ETFs can also be used for hedging market exposure. For example, long positions in the stock market could be hedged by short selling a stock index ETF or by buying an inverse stock index ETF. The high levels of liquidity and volatility along with the availability of low commission rates to enter and exit trades have also made them popular among day traders. SPDR S&P 500 ETF (SPY) tracks the S&P 500, an index based on the market capitalizations of 500 large companies with common stock listed on national stock exchanges. Broader than the Dow Jones Industrial Average, which includes only 30 companies, the S&P 500 is a widely used benchmark of the U.S. stock market. An increase or decrease in the S&P 500 Index is matched by a commensurate upward or downward move in the SPDR S&P 500 ETF. Launched by State Street Global Advisors in 1993, SPDR is the world’s largest ETF, with total assets of $267.97 billion as of Feb. 22, 2018. With a massive average daily volume of over 75 million shares, it’s also the most liquid ETF in the world. It has an expense ratio of 0.09%. 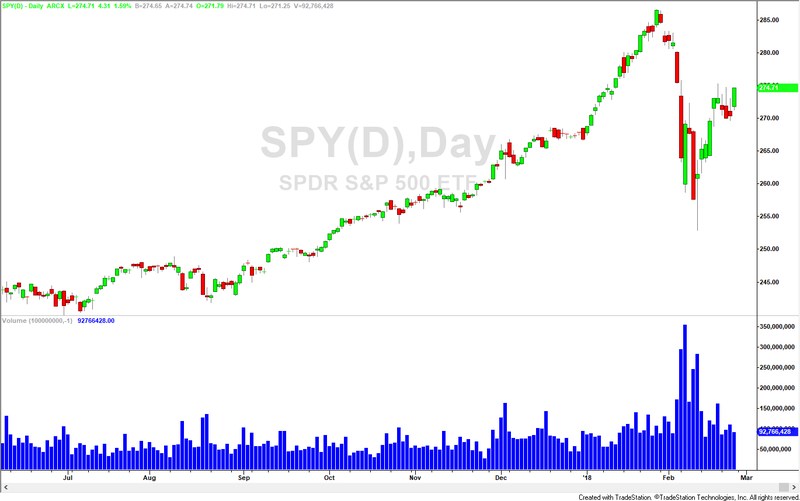 A daily chart of SPY shows the ETF’s impressive daily volume. Chart created with TradeStation. Like SPY, iShares Core S&P 500 ETF (IVV) is another fund that offers exposure to the S&P 500. In theory, these (and other) S&P 500-tracking ETFs should be the same; however, there are small differences in their structures. SPY is a unit investment trust – so it has certain limitations, such as not being able to lend out underlying shares to other firms (it also has a higher expense ratio). IVV, on the other hand, is set up as a true ETF, so it can use derivatives, portfolio lending and other strategies. Launched in 2000, the fund has $155.61 billion in total assets as of Feb. 23, 2018, an average daily volume of 3.8 million and a low expense ratio of 0.04%. The Vanguard Total Stock Market ETF (VTI) caters to investors looking for the broadest exposure to the U.S. stock market. The fund provides a simple and inexpensive way to diversify a large cap portfolio. VTI tracks the performance of the CRSP US Total Market Index, a benchmark that measures the investment return of the overall U.S. stock market. The index includes large-, mid- and small-cap stocks regularly traded on the New York Stock Exchange and Nasdaq. Launched in 2001, the fund has $93.59 billion in assets under management as of Feb. 22, 2018. VTI has an average daily volume of 2.4 million and a very low expense ratio of 0.04%. Part of Vanguard’s well-respected portfolio of funds, Vanguard S&P 500 ETF (VOO) is the newest of the top S&P 500-tracking ETFs. Like SPY and IVV, VOO boasts low costs and high liquidity, while offering the large-cap exposure you would expect from a S&P 500 benchmark fund. Unlike SPY, VOO reinvests its interim cash. PowerShares QQQ ETF (QQQ) – previously known as the QQQQ – is a widely held and traded ETF that tracks the Nasdaq 100 Index. The technology-heavy Nasdaq 100 Index includes 100 of the largest domestic and international nonfinancial companies listed on the Nasdaq by market capitalization. As a result, QQQ is heavily weighted toward large-cap tech firms. The iShares Russell 2000 ETF (IWM) tracks the broad-based Russell 2000 Index and provides investors with access to the small-cap segment of the U.S. equity market. The Russell 2000 Index is made up of the smallest 2000 companies in the Russell 3000 Index. When the Russell 2000 Index moves up or down, an equivalent move is seen in the iShares Russell 2000 Index ETF. Small-cap stocks offer large growth potential but come with a higher degree of risk. Historically, small-cap stocks have performed well during rising interest rate environments. Launched in May of 2000, the fund has total assets of $40.16 billion as of Feb. 22, 2018. Another highly liquid ETF, IWM has an average daily volume of 25.4 million and relatively high expense ratio of 0.20%. SPDR Dow Jones Industrial Average ETF (DIA) shares are sometimes referred to as "diamonds," a wordplay on the ticker symbol. The fund is managed by State Street Global Advisors and tracks the Dow Jones Industrial Average, a price-weighted index of 30 blue-chip U.S. stocks. The Dow Jones Industrial Average is one of the oldest and most closely followed stock market benchmarks in the world. Launched in 1998, the fund has net assets under management of $22.61 billion as of Feb. 22, 2018, an average daily volume of 3.4 million contracts traded and an expense ratio of 0.17%. Discover four tips for avoiding expensive ETFs. Learn why expense ratios should be low and how to prevent your investment from costing you come tax time.